Commersonia salviifolia is a member of the Malvaceae family and was previously known as Rulingia salviifolia. In 2011 all Rulingias were moved into the Commersonia genus. C. salviifolia is a medium, spreading shrub. Leaves are up to 12 centimetres long, two centimetres wide, mid green above with a dense covering of white hairs beneath. Juvenile growth is white-hairy beneath. Flowers are white, one centimetre across and held in clusters. Spring is the main flowering period and at this time blooms are both conspicuous and profuse. Foliage and flowers are attractive features. This attractive shrub is found in far northern NSW and southeast Queensland. The species has limited distribution but, at least in NSW, a population is protected in a reserve. C. salviifolia is an eye-catching shrub that, once established, has proved to be drought tolerant and frost hardy. Unfortunately the species is not readily available. We bought ours from a native nursery near Bellingen, northern NSW. The species is worth cultivating for two reasons. 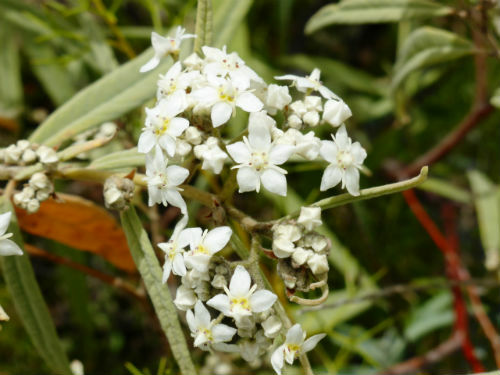 Firstly it is a free flowering, hardy shrub and secondly, C. salviifolia should be brought into cultivation to ensure the lone term survival of the species. The genus is named after P. Commerson, 18th century French doctor and naturalist whilst the species name means with leaves similar to those of the Salvia genus. Propagate from cuttings that take root rapidly.